When you set up a new website it’s very easy to get carried away with the look and feel of the site with little thought about the structure, the way it has been set up and how your products are organised. We talk a lot about this in our SEO pages on the need to have the site set up in the correct way without creating acres of duplicate content, But what happens next? Let’s assume that you are now online and trading but you are still not seeing any uplift in your Google positions. What kind of help and support are you going to need? who can you turn to to get immediate information about the platform and why it is not working for you. When you upload a product to the platform you may have done it manually or you may have been provided with a CSV file to populate so that you can bring all of the product options in. Have you set products up in the right way though? There are two ways of importing a product into VS. The first will list every product independently of every other. This means that if you have a product called ‘Carousel’ and this comes in 3 colours. Then each of these colours will have a different URL. This means that however diligent you are in describing the product on the page up to 90% of the text will be identical across the three colours. Far better for you to set up a Parent – with 3 children (the colours) – this means that the colour becomes an attribute and the single URL which will not feature the colour will have a drop down so that the consumer can select the colour without changing the Google readable URL on the page. In the new example because there is only one URL there is only one piece of copy to write on the page. It also means that Google only has to list this single URL so there is no duplicate content on your site. (Well this isn’t creating it!). The result is that this single URL will rank far higher than the three duplicates. This technique of product options & attributes is available to you. It doesn’t have to be colour, it can be finish, size, blade length, wheel size, pretty much any variable that a product is likely to be sold in. We can help you set all of this up – quickly and cleanly whilst redirecting all of your existing products to the new format. 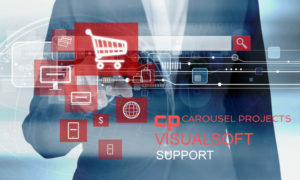 For any help you need on any part of the Visualsoft platform we can be there providing in-depth knowledge and advice along the way. You do not need to raise a ticket and then wait for the ticketing system to respond with an answer that you may not understand. With our vast amount of experience working on the platform, we can tell you right away whether something is possible or not and we will always give you more advice than you could possibly expect! You will have a dedicated helpline that you can call and receive the right piece of advice straight away. If we are not able to do this right away then you can leave a message and send an email and we will be on it immediately – fixing your problems and answering your queries in a quick and efficient manner. We are experts on the VS platform and can continually provide all the knowledge and expertise that you need, even a shoulder to cry on if need be! Not everything is possible and if you need to approach the company themselves to get a particular function switched on then we will tell you. Some small features are chargeable by VS themselves but we will always give you an idea of what to expect – big or small! Contact us today for a quotation – and don’t be scared – we don’t bite! 0161 941 2800 – hello@carouselprojects.co.uk or fill the form in page right!